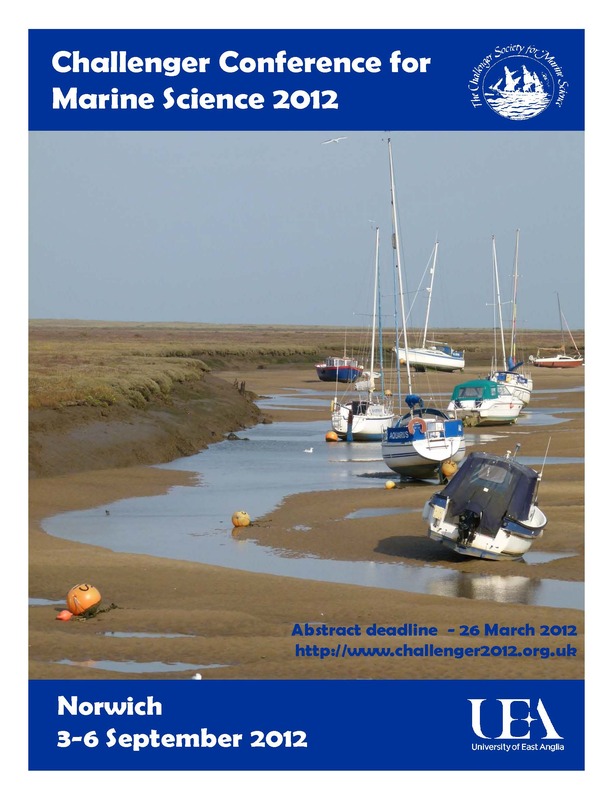 The 15th Biennial Challenger Conference for Marine Science recently took place at the University of East Anglia in Norwich, on 3-6 September 2012. There were over 100 talks, 150 posters, a contentious debate on wind power, and a talk on how the UK can maintain its current research infrastructure. Over the next week or so Words in mOcean will be bringing you a recap of the best of the action, starting with four of the keynote lectures. Today’s recap is on the lecture given by Phyllis Lam, titled ‘Microbial nitrogen cycling in oxygen minimum zones’. Enjoy! Disclaimer: The ideas talked about are based on the author’s interpretation of the talks given at Challenger 2012. Whether you’re an oceanographer, dabble in marine science or simply have a latent interest in the sea, chances are ‘nitrogen cycle’ and ‘oxygen minimum zone’ are on your list of oceanographic buzzwords. 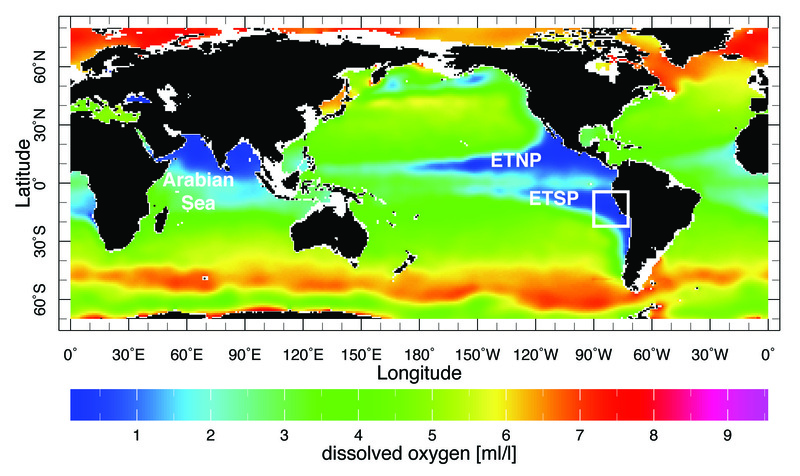 Oxygen minimum zones (OMZs) are areas of the ocean where oxygen saturation is extremely low (<20 µM); these zones are typically observed subsurface (>200 m) extending from continental west coasts in the tropics. 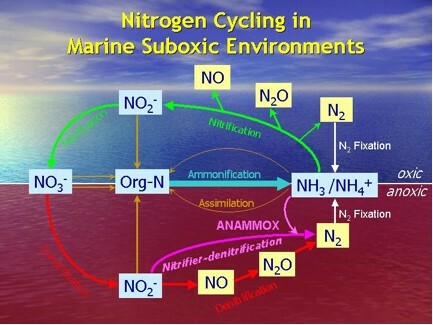 The marine nitrogen cycle is coupled with many other marine biogeochemical cycles (i.e. oxygen, phosphorus, and carbon) meaning changes in one have effects on the others. These perturbations are becoming more and more apparent with climate change, such as recent observations of OMZ expansion and predicted continuation of expansion in the future, which could result in less bioavailable nitrogen knocking on to fewer algae and less carbon fixation, and so on and so forth. Oxygen minimum zones (OMZs) in the ocean (blue). Typically, these OMZs are strongly coupled with negative N* values (N*, being a proxy by which nitrate is assessed relative to phosphate, and a negative value is representative of excess phosphate, or continual depletion of nitrate). This anomaly is intensified by a process called anammox, or anaerobic ammonium oxidation, one of the many microbial processes of the nitrogen cycle. If you’re familiar with the process of nitrogen fixation, where inert dinitrogen is converted into bioavailable ammonium by diazotrophic microbes, anammox is essentially the opposite process, and the microbes responsible convert bioavailable forms of nitrogen (nitrite and ammonium) back to dinitrogen. These anammox microbes only account for 2% of the total microbial community, but are responsible for 30-50% of total bioavailable N loss in the oceans. Another microbial process of the nitrogen cycle that removes bioavailable N from the system is denitrification. Denitrification occasionally co-occurs with anammox, but rates are temporally and spatially variable. One of the initial substrates for both processes is nitrite, which is sometimes produced via another microbial process of the nitrogen cycle: nitrate reduction (this is getting complicated, I know), which is a prevalent process in OMZs. By now you’ve either completely checked out or are holding out with interest of how on earth all of these processes are quantified and compared. Phyllis Lam’s group employs a unique approach to assessing the individual microbial processes via analysis of the functional genes that encode the main enzyme that facilitates each N transformation process. So for nitrogen fixation this would be the nif genes that code for nitrogenase, or denitrification and anammox, nirS and amo genes that encode for the nitrate reductase and ammonia monooygenase enzymes respectively. Lam’s group can detect if the genes are present in DNA extracts to determine if specific microbial groups are present, and can go a step further with RNA analyses to determine whether the genes are being expressed, implying activity of the enzymes. This method also allows for detection of co-occurring N transformations that would be obscured through rate measurement analyses. Lam P, Kuypers MMM (2011) Microbial nitrogen cycling processes in oxygen minimum zones. Annual Review of Marine Science 3:317-345. Elizabeth Sargent is currently a PhD student at the National Oceanography Centre, Southampton studying nitrogen fixation and its role in fluxes of carbon and nitrogen to the deep sea. She is also a regular contributor for Words in mOcean.